Figure 3 is a side elevation view of said pyrophoric lighter. This Ronson vintage black & white magazine advertisement was published in Esquire on December 1936. It presents the wide range of Ronson lighters: touch-tip desk models, automatic pocket models and the neat penciliter. The Ronson Victor was manufactured between 1952 and 1955 in Newark, N.J. in the United States. 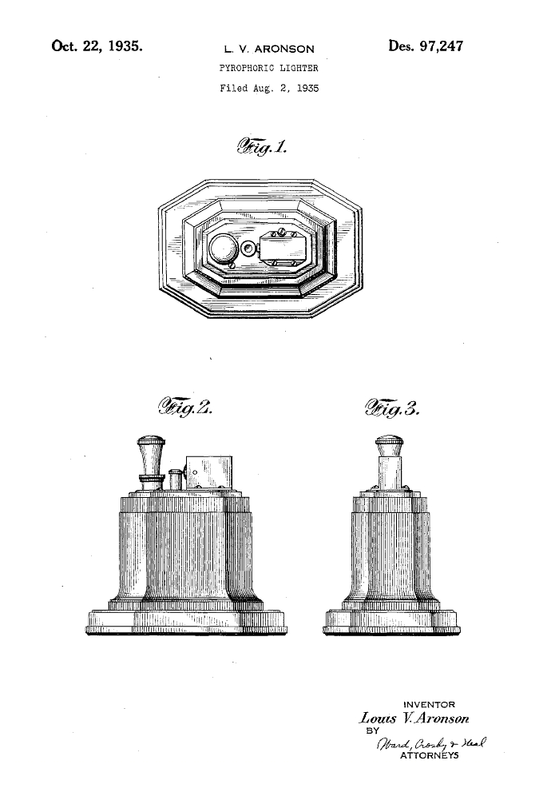 It was, next to Ronson Viceroy, the first gas table lighter model manufactured by Ronson. The cuboid body was available in tan (see photo) and green leather and tooled with 24K gold stripes. Padded with brown felt at the bottom. 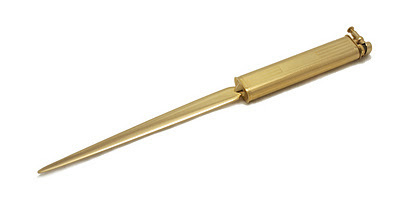 The Dunhill 'Sylph' Letter Opener/Lighter was manufactured between 1958 and 1961 in England. This lift arm wick lighter is a combination of the smallest Dunhill 'Sylph Ruler' (handle) and a letter opener blade. It was produced in two finishes: silver plate and gold plate. The handle was made of brass and was available plated with a monogram shield or covered with pig skin colored in red or brown. This Colibri magazine advertisement was published in The Illustrated London News on the 14th of November, 1964. It presents a part of the great Colibri pocket and table lighters assortment, like the monopol, monogas and minigas models. This figural wick lighter was manufactured by Negbaur between 1940 and 1949 in Allbright, New York in the United States. It is made of die cast metal in a dark cooper antique (uncommon) or chrome plate finish (rare). It presents a set of golf clubs in a golf bag. When the putter is pushed the top section flips open and the lighter lights. 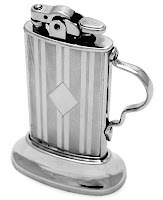 The Golf Bag lighter was advertised as a "practical and novelty lighter for the desk or table". It was a bestseller on the Negbaur's list. 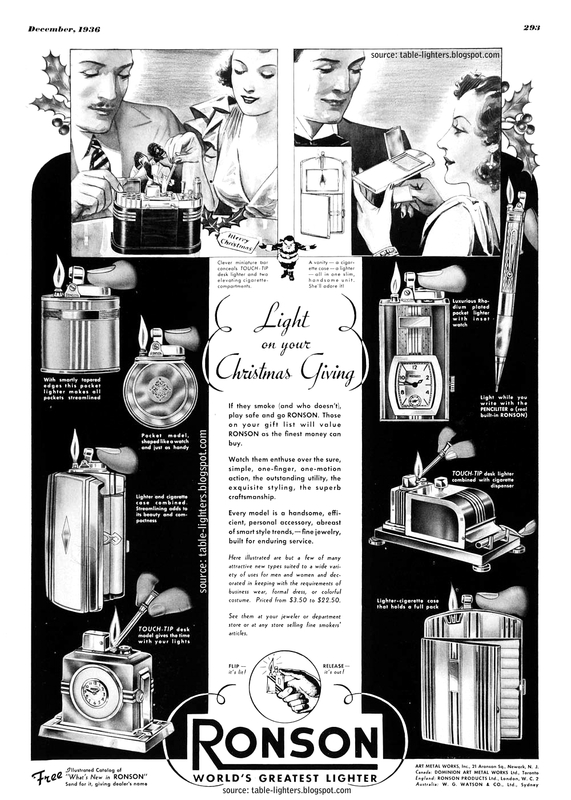 Negbaur was well known for their other solid built figural lighters, like planes, knights, canons, chess figures or planes made in the earlier years (1930s and 1940s). The Negbaur Golf Bag is very collectible as it is well build and designed. As many of them were manufactured it is not a problem to find one in excellent shape. This Ronson table lighter was made between 1955 and 1957 in England by Ronson and Wedgwood. The Ronson 'Ulysses' was marketed with two different Ronson chrome plated fitments: Cadet and Rondelight. 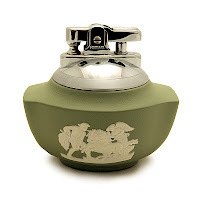 They were mounted in a Wedgwood light green (see photo) or blue Jasper base with overlaid design – heroic battle scene – in white ceramic. The lighter was also available with a matching ashtray. 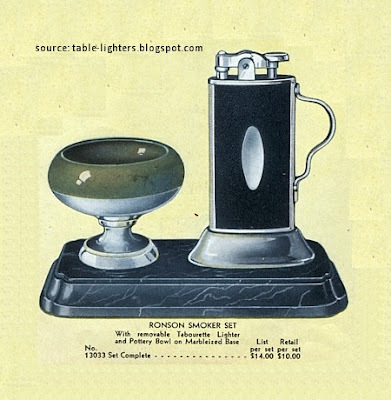 The Ulysses scene was also used in the Ronson butane table lighter eleven years later. 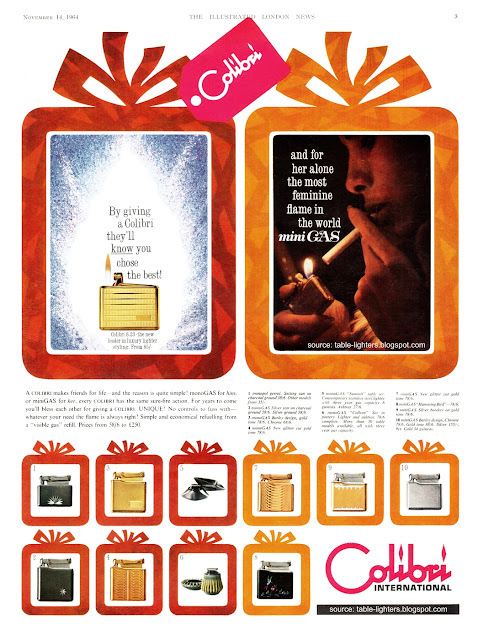 As the purpose of this blog is to enhance the knowledge on cigarette lighters and it accessories I decided to share with you some of the most interesting stories coming from a small booklet called the Lighter Repair Manual which was written by Gilbert J. Gaugler for Lighter Parts Inc. in 1954. This is a standard wick that will work in most any popular lighter. It is chemically treated to keep it from burning. This is a special modification of the standard wick. It has two notable improvements. It is equipped with a wire inserter, attached to the bottom end by means of a plastic tip. At the top of the wick is a small gold colored ferrule which fits the wick hole of most popular lighters. This small ferrule acts as a seal and reduces the size of the wick hole; cutting down on evaporation, preventing leakage, and prolonging the fuel's lasting qualities. This is another wick (red in color) equipped with the wire inserter and a special ferrule that fits the wick hole on most Evans lighters. This is an exceptionally large diameter wick and can be used only in the Galter Giant lighter. This wick is made of non inflammable material (asbestos). It is woven of several strands and the exposed portion in the top of the lighter can be frayed so that several ends are exposed to the sparks from the flint. This helps the lighter to light even in a wind. This is a repairman's wick. It can be pulled through the lighter and a six inch wick cut of. Te the remaining six inches portion, with its wire inserter, can be used in another lighter. This wick is slightly smaller in diameter than average, due to small wick hole in Dunhill lighters. Has a flat metal inserter that reduces wick to correct size and guides it through the lighter. This wick is in same diameter as standard, but woven of spun glass. It is very stiff and hard to work with. It does not burn, but chars away until there is nothing left to get hold of to pull it up. Where to buy a wick nowadays? You may take a look at THIS POST.